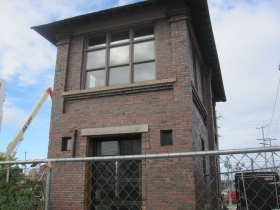 Third Ward's "Interlocking" Tower may be only such residential home in America. 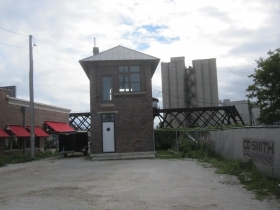 Tiny Railroad Tower House Is Unique. Photo by Michael Horne. How do you landscape the area around an 840-square-foot building that sits at a foot of a bridge and abuts a railroad, with little land of its own? For a century the answer was, “you don’t!” and that is what transpired at the old Chicago & North Western Railway Interlocking Tower located at the foot of N. Jefferson St. in the Historic Third Ward. This was true urban grit, just blocks from Downtown, on a riverfront jammed with warehouses, and C&NW Swing Bridge #1556 that spun back and forth accommodating the conflicting demands of maritime vessels and the northwest-bound trains emanating from the nation’s busiest railroad hub, 90 miles to the south, in Chicago. The primary beneficiary of the landscaping will be the public, which for the first time will have safe and legal access to the 40-foot-by-150-foot railroad trestle, and the proposed greenspace between it and the DoMUS apartment building that is half again as large. All is to be rehabilitated and decked with greenery, seating and walking areas according to the plans drawn by Jim Shields of HGA Architects. It’s a miniature version of New York City’s catalytic High Line Park, Jannene reported Whitney Gould saying..
On an open stretch along the river he spied “this tall thin building” standing near some train tracks that led out toward a railroad turnbridge. He stopped his car and started photographing. He remembers that his heart was pounding. “If you can fall in love with a building, that’s what I did,” he says, laughing. 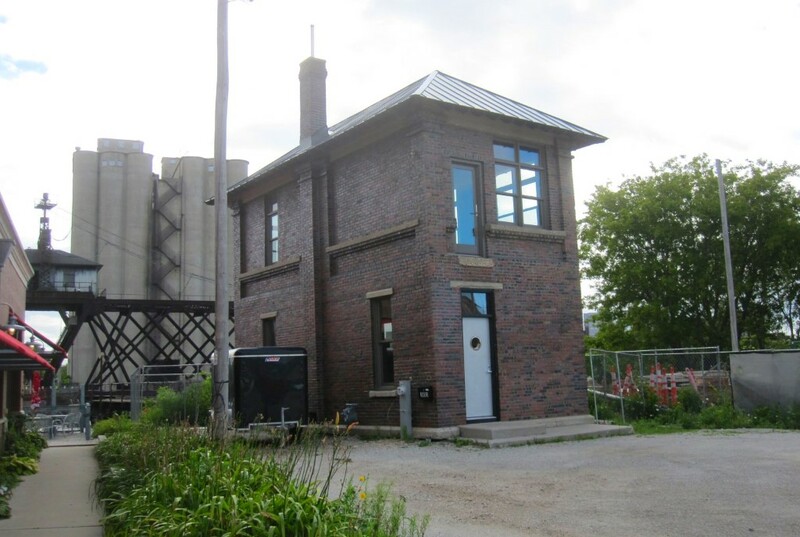 Martin spent years doing the rudimentary work of converting a railroad building into a passable (if small) studio and residence. He patched the roof, later upgrading it to steel from the original asphalt shingles, and added skylights. Of course, the new construction obliged the Assessor to pay a visit to the tiny property so it would pull its proper weight on the tax rolls of this town. The bread and butter of the assessment business lies in “comparable sales” — the many thousands of ordinary, more-or-less similar, and frequently identical residential units that make up the bulk of the city’s taxable property. Determining value is relatively easy when the property in question is a Bungalow, or Ranch House, since so many change hands in arms-length transactions, but when the residence in question is a former Interlocking Tower for the Chicago & North Western Railway, the Assessor must dig deep into the well of his training to come up with a fair market value. This is complicated by the fact that there are likely fewer than 100 of these buildings remaining nationwide. With the exception of this one, none of the few towers to have been restored appear to be in residential use. Roof new. Brick needs tuckpointing. Concrete sills very deteriorated. Very small lot is “remnant” size and directly up against tracks. First floor is galley kit., 3/4 bath, table space refrig. and stack washer dryer under stairwell. Up is all studio area with a sleeping loft tucked under coved ceiling. Possibilities are severely limited by small amount of space available and owner’s funds. No closets or storage space. Walls are about 18 inches thick. Nice view from 2nd floor, though. Soon, the view will include one of the most intensively detailed small outdoor spaces in the city — a $1.2 million park that will grace the setting of this small building, now appraised at $15,000 and its 3,750 square foot lot, which is valued at $112,500. Financing will come from the $20 million Erie Jefferson Riverwalk Tax Incremental Financing District 56, created in 2004. At that time the assessed value of the district, which runs along the east bank of the river from the Broadway Bridge to the lake, was about $10 million. In 2015, following the construction of new buildings, and the rehabilitation of old ones, the district’s assessed valuation stood at $127,731,400. The home today appears to be every bit the construction site that it has been for the past 26 years. The improvements visible from the outside include new windows and doors, with the potential for a nice deck on the river. The majority of the site consists of a parking lot. To the east the Riverfront Pizzeria Bar & Grill occupies a portion of the old Hansen Storage building. Access to the Riverwalk lies between the two buildings, and a portion of the future Trestle Park is accessible beyond. Landscaping is observed in the breech, with vines and junk plants obscuring the view of the river. The building has a disconcerting feature consisting of a glass door on the second floor with no stairs leading to it. Formerly the exterior stairway here was the only access to the switching room above. 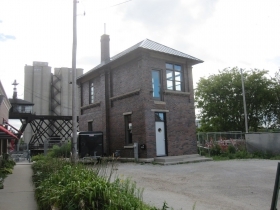 When the owner incorporated an interior staircase, he was surprised to find that the rebar on the second floor consisted of rails, such as those that the C&NW trains rode as they passed this building for decades. What is an “Interlocking Tower”? When the subject in question is any aspect of railroading, the researcher can always be confident that somebody out there is an expert who is positively consumed with the topic under investigation, no matter how obscure. The apparatus prevents “conflicting movements through an arrangement of tracks such as junctions or crossings,” according to one definition. The goal was safety, and the orderly operation of the rails. The systems were absolutely crucial when a single track carried trains in both directions. In other words, the Interlocking Machine was a sort of circuit board, albeit one that required musclepower to operate the many switches and levers that comprised a system. The Interlocking Towers were usually located at busy bottleneck points or railroad junctions. Here is a video of one in operation. City of Milwaukee records date this building to 1900, but that seems like just a guess, especially since this structure does not appear on a 1910 map. The 1995 Journal Sentinel article suggested the building dated to 1927, but did not offer a citation. More likely the structure dates to 1915 when the C&NW RR Swing Bridge #1556 was constructed, replacing an 1898 bridge that carried traffic between Chicago and the Twin Cities and beyond. Prior to the construction of the bridge, temporary tracks were laid to divert the traffic to the north. The old bridge was cut from its moorings, and floated to its new location, while the present structure was constructed in situ. Upon completion, trains then ran on the new bridge, and the old was abandoned and dismantled. Traffic was disrupted for only a few hours. Subdivision: None Found. Complicated riparian site. Year Built: According to City: 1900; However building most likely dates to construction of adjacent bridge in 1915, according to Engineering News November 26, 1915, p. 1051. Structure does not appear on maps of 1894 and 1910. Assessment: Land: 3,750 square foot lot is valued at $112,500 ($30.00/sq. ft.). Improvements: $15,000. Total assessed valuation: $127,500. Walk Score: 81 out of 100. “Very Walkable” Most errands can be accomplished on foot. City Average: 62 out of 100. Transit Score: 59 out of 100. “Good Transit” Many nearby public transportation options. City average: 49 out of 100. Love this place and loved this article! The kind of place I’d dream about living in as a child. Ok, so i just read the article, in my early morning haze, but not sure if is currently the owners residence or ??? Greg I always wondered what happened to you after we worked together at the Fortress..remember? you were working on the house at that time and I was privileged to tour it with you. i’m living in West Bend and still writing for the Shepherd Express…when we shared floor space at the Fortress I could see, even then that you had extreme talent…the bend plywood thing you were making..a chair wasn’t it? I really love these stories about local structures. Do you really take these photos with the tiny camera I saw you with yesterday? I use to work in the neighborhood and recall a story about someone falling off a ladder while doing interior work, and laying helpless for several days before being discovered. Circa 2000? Would absolutely love to live in a place like this. Glad this old structure (18″ wall, wow) has found a new life. I remember passing by it many times, once when the Circus train crept by with the 1385 C&NW at the lead. Swapping the rails for a park seems like a great idea. 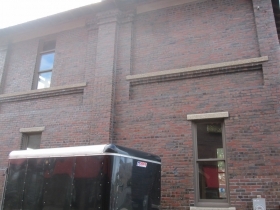 Great article… it answers all the questions I’ve had about that building for most of my life! I’m glad the building is being put to good use rather than being razed (same goes with the swing bridge). 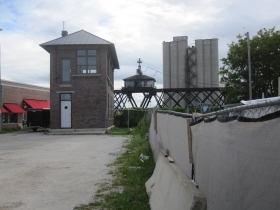 As a railran, those two structures are all that is left as reminders that the C&NW used to occupy most of Milwaukee’s lakefront at one time. 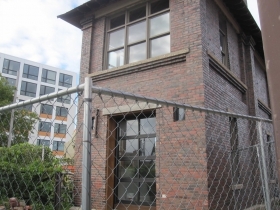 Oh, and the taxes on that building are insane… $4.5k for a postage stamp? Yikes… Milwaukee taxes are crazy!